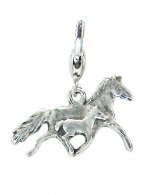 Barbary I love horses charm holder. 3 pieces per package. Barbary silver heart w/pink stone charm on lobster claw. 3 pieces per package. Barbary aqua stone ball charm on lobster claw. 3 pieces per package. Barbary peridot stone ball charm on lobster claw. 3 pieces per package. Barbary pink stone ball charm on lobster claw. 3 pieces per package. Barbary fleur-de-lis crystal stone charm on lobster claw. 3 pieces per package. Barbary crystal stone ball charm on lobster claw. 3 pieces per package. Barbary silver heart with crystal stone charm on lobster claw. 3 pieces per package. Barbary crystal stone heart outline charm on lobster claw. 3 pieces per package. Barbary silver heart w/jet stone charm on lobster claw. 3 pieces per package. Barbary top hat charm on lobster claw. Retro silver finish. 3 pieces per package. Barbary Fleur De Lis with crystal stone on lobster claw. 3 pieces. Barbary adjustable necklace for charm carriers and Joppa beads. Available for shipment September 15, 2011. 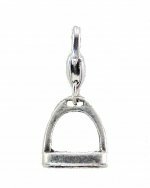 Barbary snaffle bail charm holder with crystal stones. 3 pieces per package. Barbary horse head in rope charm on lobster claw. Retro silver finish. 3 pieces per package. Barbary turquoise riverstone stretch bracelet size sm/med. Crystal oval stone charm included with bracelet. Barbary Rearing horse charm on lobster claw. Retro silver finish. 3 pieces per package. Barbary mom & babe charm on lobster claw. Retro silver finish. 3 pieces per package. Barbary fluffytail charm on lobster claw. Retro silver finish. 3 pieces per package. Barbary stirrup charm on lobster claw. 3 pieces per package. 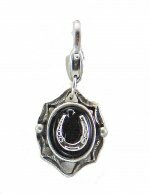 Barbary horse head in shoe charm on lobster claw. Retro silver finish. 3 pieces per package. Barbary double horse shoe charm on lobster claw. Retro silver finish. 3 pieces per package. 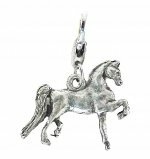 Barbary horse head in heart charm on lobster claw. Retro silver finish. 3 pieces per package. Barbary heart locket with horse shoe charm on lobster claw. 3 pieces per package. Barbary pink crystal stone heart outline charm on lobster claw. 3 pieces per package. Barbary saddlebred charm on lobster claw. Retro silver finish. 3 pieces per package. Barbary turquoise riverstone stretch bracelet size med/lg. Crystal oval stone charm included with bracelet. 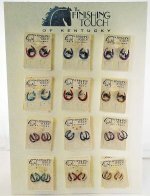 Stock Pin Assortment Assortment of 24 stock pins 12 plated 14kg; 12 plated durable imitation rhodium (silver). The assortment is made up of the following styles: HPN1000 HPN1002 HPN10004 HPN1013 HPN1024 HPN1026 HPN1037 HPN1053 HPN1057 HPN1058 HPN1077 HPN1080 HPN1042 HPN1104 HPN1113 HPN1121 HPN1122 HPN1156 HPN1162 HPN1163 HPN1177 HPN1179 HPN1180 HPN1193 2 of each of all styles Merchandised on acrylic spinner rack 7 1/2" x 11 1/4" tall. Stock Pin Assortment Assortment of 24 stock pins 12 plated 14kg; 12 plated durable imitation rhodium (silver). The assortment is made up of the following styles: HPN1000 HPN1002 HPN10004 HPN1013 HPN1024 HPN1026 HPN1037 HPN1053 HPN1057 HPN1058 HPN1077 HPN1080 HPN1042 HPN1104 HPN1113 HPN1121 HPN1122 HPN1156 HPN1162 HPN1163 HPN1177 HPN1179 HPN1180 HPN1193 3 of each of all styles Merchandised on acrylic spinner rack 7 1/2" x 11 1/4" tall. Stock Pin Assortment Assortment of 24 stock pins 12 plated 14kg; 12 plated durable imitation rhodium (silver). 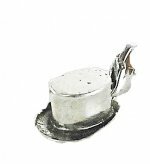 The assortment is made up of the following styles: HPN1000 HPN1010 HPN1013 HPN1015 HPN1018 HPN1024 HPN1026 HPN1037 HPN1056 HPN1076 HPN1077 HPN1080 HPN1121 HPN1100 HPN1104 HPN1106 HPN1110 HPN1117 HPN1113 HPN1122 HPN1180 HPN1156 HPN1176 HPN1177. 3 each 24 styles Merchandised on acrylic spinner rack 7 1/2" x 11 1/4" tall. GRAY ADJUSTABLE ELASTIC BRACELET ON “I HEART HORSES” CARRIER WITH OVAL CRYSTAL SNAP ON CHARM. GREY ADJUSTABLE ELASTIC BRACELET ON “I HEART HORSES” CARRIER WITH OVAL CRYSTAL SNAP ON CHARM. 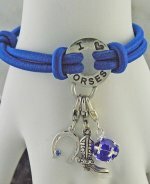 NAVY ADJUSTABLE ELASTIC BRACELET ON “I HEART HORSES” CARRIER WITH OVAL CRYSTAL SNAP ON CHARM. BURGUNDY ADJUSTABLE ELASTIC BRACELET ON “I HEART HORSES” CARRIER WITH OVAL CRYSTAL SNAP ON CHARM. 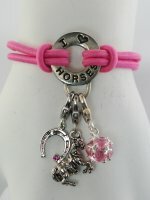 FUSCHIA ADJUSTABLE ELASTIC BRACELET ON “I HEART HORSES” CARRIER WITH OVAL CRYSTAL SNAP ON CHARM. Stylish adjustable elastic bracelet on “I Heart Horses” carrier with 3 charms: horse head in oval, jet rhinestone ball, and silver heart with jet rhinestone in center. Black elastic. Popular for all ages; wearing multiples on one arm is very fashionable. 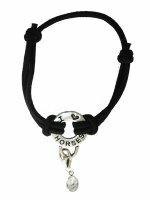 Stylish adjustable elastic bracelet on “I Heart Horses” carrier with 3 charms: Cowboy boot, cowboy hat, and framed faux turquoise stone with horse shoe. Black elastic. Popular for all ages; wearing multiples on one arm is very fashionable. Stylish adjustable elastic bracelet on “I Heart Horses” carrier with 3 charms: Horse shoe with star, rose rhinestone ball, and silver heart with rose rhinestone in center. Pink elastic. Popular for all ages; wearing multiples on one arm is very fashionable. 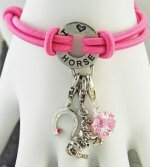 Stylish adjustable elastic bracelet on “I Heart Horses” carrier with 3 charms: Silver horse head, framed pink mussel stone with horse shoe, and silver horse shoe with rose rhinestone accent. Pink elastic. Popular for all ages; wearing multiples on one arm is very fashionable. 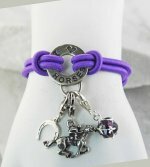 Stylish adjustable elastic bracelet on “I Heart Horses” carrier with 3 charms: Rearing horse with saddle, amethyst purple rhinestone ball, and silver horseshoe with amethyst purple rhinestone accent. Purple elastic. Popular for all ages; wearing multiples on one arm is very fashionable. 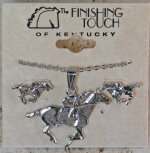 Stylish adjustable elastic bracelet on “I Heart Horses” carrier with 3 charms: Cowboy hat, horse with head turned charm, and silver horseshoe with crystal rhinestone. Purple elastic. Popular for all ages; wearing multiples on one arm is very fashionable. 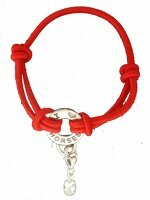 Stylish adjustable elastic bracelet on “I Heart Horses” carrier with 3 charms: Horse head in shoe, cowboy boot, silver heart with ruby red rhinestone in center. Ruby red elastic. Popular for all ages; wearing multiples on one arm is very fashionable. Stylish adjustable elastic bracelet on “I Heart Horses” carrier with 3 charms: Tiny saddlebred horse, silver top hat, silver award ribbon with sapphire blue rhinestone accent. Sapphire blue elastic. Popular for all ages; wearing multiples on one arm is very fashionable. 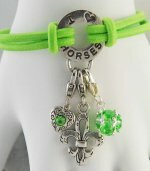 Stylish adjustable elastic bracelet on “I Heart Horses” carrier with 3 charms: Silver fleur de lis, peridot green rhinestone ball, silver heart with peridot green rhinestone in center. Green elastic. Popular for all ages; wearing multiples on one arm is very fashionable. 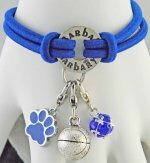 Stylish adjustable elastic bracelet on “BARBARY” carrier with 3 charms: Blue enamel cat’s paw, sapphire blue rhinestone ball, silver basketball. Sapphire blue elastic. Popular for all ages; wearing multiples on one arm is very fashionable. 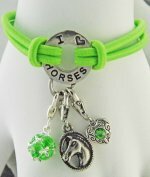 Stylish adjustable elastic bracelet on “I Heart Horses” carrier with 3 charms: Silver horse head in oval, peridot green rhinestone ball, silver heart with peridot green rhinestone in center. Green elastic. Popular for all ages; wearing multiples on one arm is very fashionable. 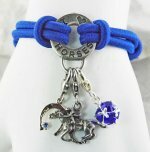 Stylish adjustable elastic bracelet on “I Heart Horses” carrier with 3 charms: Rearing horse with saddle, sapphire blue rhinestone ball, silver horse shoe with sapphire blue rhinestone accent. Sapphire blue elastic. Popular for all ages; wearing multiples on one arm is very fashionable. Stylish adjustable elastic bracelet on “I Heart Horses” carrier with 3 charms: Horse shoe with star, peridot green rhinestone ball, silver heart with peridot green rhinestone in center. Green elastic. Popular for all ages; wearing multiples on one arm is very fashionable. 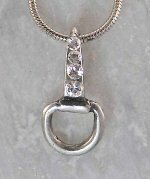 Stylish adjustable elastic bracelet on “I Heart Horses” carrier with 3 charms: horse shoe with star, jet rhinestone ball, and silver heart with jet rhinestone in center. Black elastic. Popular for all ages; wearing multiples on one arm is very fashionable. 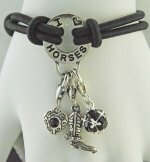 Stylish adjustable elastic bracelet on “I Heart Horses” carrier with 3 charms: Cowboy boot, jet rhinestone ball, and silver heart with jet rhinestone in center. Black elastic. Popular for all ages; wearing multiples on one arm is very fashionable. Stylish adjustable elastic bracelet on “I Heart Horses” carrier with 3 charms: Cowboy hat, jet rhinestone ball, and silver heart with jet rhinestone in center. Black elastic. Popular for all ages; wearing multiples on one arm is very fashionable. Stylish adjustable elastic bracelet on “I Heart Horses” carrier with 3 charms: Cowboy boot, rose rhinestone ball, and silver heart with rose rhinestone in center. Pink elastic. Popular for all ages; wearing multiples on one arm is very fashionable. Stylish adjustable elastic bracelet on “I Heart Horses” carrier with 3 charms: Cowboy hat, rose rhinestone ball, and silver heart with rose rhinestone in center. Pink elastic. Popular for all ages; wearing multiples on one arm is very fashionable. 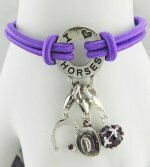 Stylish adjustable elastic bracelet on “I Heart Horses” carrier with 3 charms: Cowboy boot, amethyst purple rhinestone ball, and silver horseshoe with amethyst purple rhinestone accent. Purple elastic. Popular for all ages; wearing multiples on one arm is very fashionable. Stylish adjustable elastic bracelet on “I Heart Horses” carrier with 3 charms: Cowboy hat, amethyst purple rhinestone ball, and silver horseshoe with amethyst purple rhinestone. Purple elastic. Popular for all ages; wearing multiples on one arm is very fashionable. Stylish adjustable elastic bracelet on “I Heart Horses” carrier with 3 charms: Cowboy hat, aqua rhinestone ball, silver horse shoe with aqua rhinestone accent. Winter white elastic. Popular for all ages; wearing multiples on one arm is very fashionable. 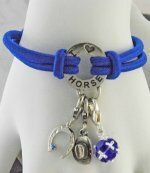 Stylish adjustable elastic bracelet on “I Heart Horses” carrier with 3 charms: Cowboy boot, sapphire blue rhinestone ball, silver horse shoe with sapphire blue rhinestone accent. Sapphire blue elastic. Popular for all ages; wearing multiples on one arm is very fashionable. 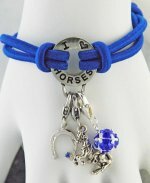 Stylish adjustable elastic bracelet on “I Heart Horses” carrier with 3 charms: Cowboy hat, sapphire blue rhinestone ball, silver horse shoe with sapphire blue rhinestone accent. Sapphire blue elastic. Popular for all ages; wearing multiples on one arm is very fashionable. 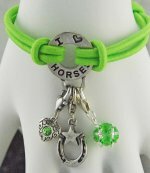 Stylish adjustable elastic bracelet on “I Heart Horses” carrier with 3 charms: Cowboy boot, peridot green rhinestone ball, silver horse shoe with peridot green rhinestone accent. Green elastic. Popular for all ages; wearing multiples on one arm is very fashionable. Stylish adjustable elastic bracelet on “I Heart Horses” carrier with 3 charms: Cowboy hat, peridot green rhinestone ball, and silver horse shoe peridot green rhinestone accent. Green elastic. Popular for all ages; wearing multiples on one arm is very fashionable. 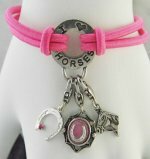 Stylish adjustable elastic bracelet on “I Heart Horses” carrier with 3 charms: Thoroughbred, pink rhinestone ball, and silver heart with pink rhinestone accent. Pink elastic. Popular for all ages; wearing multiples on one arm is very fashionable. Stylish adjustable elastic bracelet on “I Heart Horses” carrier with 3 charms: Thoroughbred, black rhinestone ball, and silver heart with black rhinestone accent. Black elastic. Popular for all ages; wearing multiples on one arm is very fashionable. 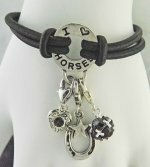 Stylish adjustable elastic bracelet on “I Heart Horses” carrier with 3 charms: Jumper charm, black rhinestone ball, and silver heart with black rhinestone accent. Black elastic. Popular for all ages; wearing multiples on one arm is very fashionable. 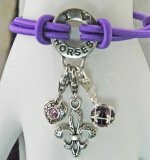 Stylish adjustable elastic bracelet on “I Heart Horses” carrier with 3 charms: Fleur-di-lis charm, purple rhinestone ball, and silver heart with purple rhinestone accent. Purple elastic. Popular for all ages; wearing multiples on one arm is very fashionable. 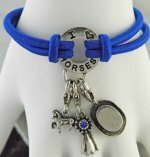 Stylish adjustable elastic bracelet on “I Heart Horses” carrier with 3 charms: Rearing horse charm , blue rhinestone ball, and silver heart with blue rhinestone accent. Royal elastic. Popular for all ages; wearing multiples on one arm is very fashionable. Stylish adjustable elastic bracelet on “I Heart Horses” carrier with 3 charms: Horse shoe with star, purple rhinestone ball, and silver heart with purple rhinestone in center. Purple elastic. Popular for all ages; wearing multiples on one arm is very fashionable. Stylish adjustable elastic bracelet on “I Heart Horses” carrier with 3 charms: Horse shoe with star, siam rhinestone ball, and silver heart with siam rhinestone in center. Red elastic. Popular for all ages; wearing multiples on one arm is very fashionable. Stylish adjustable elastic bracelet on “I Heart Horses” carrier with 3 charms: Horse shoe with star, sapphire rhinestone ball, and silver heart with sapphire rhinestone in center. Royal blue elastic. Popular for all ages; wearing multiples on one arm is very fashionable. 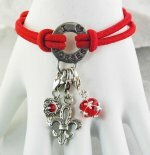 Stylish adjustable elastic bracelet on “I Heart Horses” carrier with 3 charms: Fleur-di-lis charm, rose rhinestone ball, and silver heart with rose rhinestone accent. Pink elastic. Popular for all ages; wearing multiples on one arm is very fashionable. Stylish adjustable elastic bracelet on “I Heart Horses” carrier with 3 charms: Fleur-di-lis charm, siam rhinestone ball, and silver heart with siam rhinestone accent. Red elastic. Popular for all ages; wearing multiples on one arm is very fashionable. 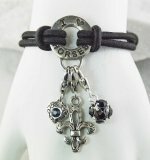 Stylish adjustable elastic bracelet on “I Heart Horses” carrier with 3 charms: Fleur-di-lis charm, sapphire rhinestone ball, and silver heart with sapphire rhinestone accent. Royal blue elastic. Popular for all ages; wearing multiples on one arm is very fashionable. Stylish adjustable elastic bracelet on “I Heart Horses” carrier with 3 charms: Cowboy boot, jet rhinestone ball, and silver heart with crystal rhinestone in center. Black elastic. Popular for all ages; wearing multiples on one arm is very fashionable. 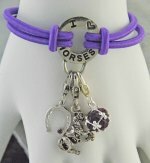 Stylish adjustable elastic bracelet on “I Heart Horses” carrier with 3 charms: Cowboy boot, purple rhinestone ball, and silver heart with purple rhinestone in center. Purple elastic. Popular for all ages; wearing multiples on one arm is very fashionable. 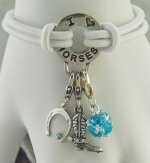 Stylish adjustable elastic bracelet on “I Heart Horses” carrier with 3 charms: Cowboy boot, aqua rhinestone ball, and silver heart with crystal rhinestone in center. White elastic. Popular for all ages; wearing multiples on one arm is very fashionable. Stylish adjustable elastic bracelet on “I Heart Horses” carrier with 3 charms: Cowboy boot, peridot rhinestone ball, and silver heart with peridot rhinestone in center. Lime green elastic. Popular for all ages; wearing multiples on one arm is very fashionable. 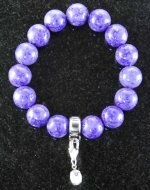 Stylish adjustable elastic bracelet on “I Heart Horses” carrier with 3 charms: Thoroughbred, purple rhinestone ball, and silver heart with purple rhinestone accent. Purple elastic. Popular for all ages; wearing multiples on one arm is very fashionable. Stylish adjustable elastic bracelet on “I Heart Horses” carrier with 3 charms: Thoroughbred, siam rhinestone ball, and silver heart with siam rhinestone accent. Red elastic. Popular for all ages; wearing multiples on one arm is very fashionable. Stylish adjustable elastic bracelet on “I Heart Horses” carrier with 3 charms: Thoroughbred, sapphire rhinestone ball, and silver heart with sapphire rhinestone accent. Royal blue elastic. Popular for all ages; wearing multiples on one arm is very fashionable. 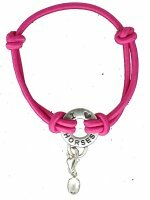 Stylish adjustable elastic bracelet on “I Heart Horses” carrier with 3 charms: Thoroughbred, pink stone ball, and silver horse shoe with pink rhinestone accent. Burgundy elastic. Popular for all ages; wearing multiples on one arm is very fashionable. 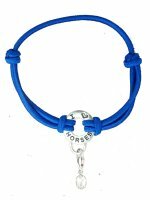 Stylish adjustable elastic bracelet on “I Heart Horses” carrier with 3 charms: Thoroughbred, blue stone ball, and silver horse shoe with blue rhinestone accent. Grey elastic. Popular for all ages; wearing multiples on one arm is very fashionable. 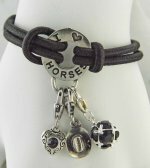 Stylish adjustable elastic bracelet on “I Heart Horses” carrier with 3 charms: Horse with head turned, black stone colored ball, and silver heart with black rhinestone accent. Grey elastic. Popular for all ages; wearing multiples on one arm is very fashionable. 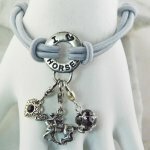 Stylish adjustable elastic bracelet on “I Heart Horses” carrier with 3 charms: Horse with head turned, crystal stone colored ball, and silver heart with crystal rhinestone accent. Navy elastic. Popular for all ages; wearing multiples on one arm is very fashionable. 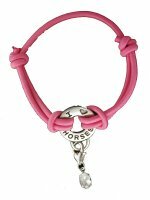 Stylish adjustable elastic bracelet on “I Heart Horses” carrier with 3 charms: Horse with head turned, pink stone colored ball, and silver heart with pink rhinestone accent. Burgundy elastic. Popular for all ages; wearing multiples on one arm is very fashionable. 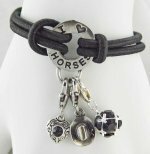 Stylish adjustable elastic bracelet on “I Heart Horses” carrier with 3 charms: heart with light rose stone, amethyst stone ball, and retro silver horse with head turned charm. Fuschia elastic. Popular for all ages; wearing multiples on one arm is very fashionable. 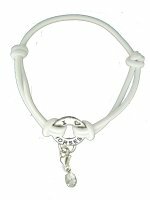 Stylish adjustable elastic bracelet on “I Heart Horses” carrier with 3 charms: Fleur-di-lis charm, jet rhinestone ball, and silver heart with jet rhinestone accent. Black elastic. Popular for all ages; wearing multiples on one arm is very fashionable. Stylish adjustable elastic bracelet on “I Heart Horses” carrier with 3 charms: Thoroughbred, peridot rhinestone ball, and silver heart with peridot rhinestone accent. Lime green elastic. Popular for all ages; wearing multiples on one arm is very fashionable. Stylish adjustable elastic bracelet on “I Heart Horses” carrier with 3 charms: Thoroughbred, jet rhinestone ball, and silver heart with jet rhinestone accent. Grey elastic. Popular for all ages; wearing multiples on one arm is very fashionable. Stylish adjustable elastic bracelet on “I Heart Horses” carrier with 3 charms: Thoroughbred, jet stone ball, and silver horse shoe with crystal rhinestone accent. Black elastic. Popular for all ages; wearing multiples on one arm is very fashionable. 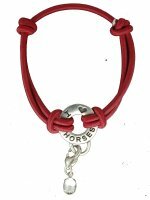 Stylish adjustable elastic bracelet on “I Heart Horses” carrier with 3 charms: Thoroughbred, rose stone ball, and silver horse shoe with rose rhinestone accent. Pink elastic. Popular for all ages; wearing multiples on one arm is very fashionable. 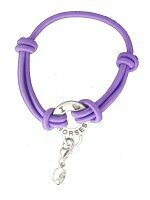 Stylish adjustable elastic bracelet on “I Heart Horses” carrier with 3 charms: Thoroughbred, purple stone ball, and silver horse shoe with purple rhinestone accent. Purple elastic. Popular for all ages; wearing multiples on one arm is very fashionable. 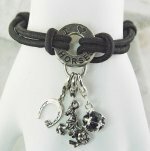 Stylish adjustable elastic bracelet on “I Heart Horses” carrier with 3 charms: Thoroughbred, siam stone ball, and silver horse shoe with crystal rhinestone accent. Red elastic. Popular for all ages; wearing multiples on one arm is very fashionable. 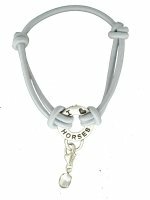 Stylish adjustable elastic bracelet on “I Heart Horses” carrier with 3 charms: Thoroughbred, aqua stone ball, and silver horse shoe with aqua rhinestone accent. White elastic. Popular for all ages; wearing multiples on one arm is very fashionable. 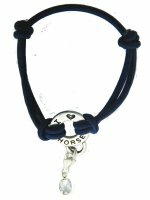 Stylish adjustable elastic bracelet on “I Heart Horses” carrier with 3 charms: Thoroughbred, sapphire stone ball, and silver horse shoe with sapphire rhinestone accent. Royal blue elastic. Popular for all ages; wearing multiples on one arm is very fashionable. 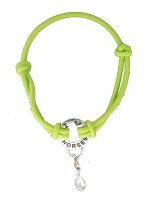 Stylish adjustable elastic bracelet on “I Heart Horses” carrier with 3 charms: Thoroughbred, peridot stone ball, and silver horse shoe with peridot rhinestone accent. Lime green elastic. Popular for all ages; wearing multiples on one arm is very fashionable. Stylish adjustable elastic bracelet on “I Heart Horses” carrier with 3 charms: Jumper charm, rose rhinestone ball, and silver heart with rose rhinestone accent. Pink elastic. Popular for all ages; wearing multiples on one arm is very fashionable. 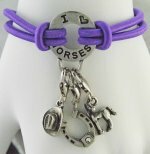 Stylish adjustable elastic bracelet on “I Heart Horses” carrier with 3 charms: Jumper charm, purple rhinestone ball, and silver heart with purple rhinestone accent. Purple elastic. Popular for all ages; wearing multiples on one arm is very fashionable. Stylish adjustable elastic bracelet on “I Heart Horses” carrier with 3 charms: Jumper charm, siam rhinestone ball, and silver heart with siam rhinestone accent. Red elastic. Popular for all ages; wearing multiples on one arm is very fashionable. 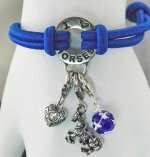 Stylish adjustable elastic bracelet on “I Heart Horses” carrier with 3 charms: Jumper charm, sapphire rhinestone ball, and silver heart with sapphire rhinestone accent. Royal blue elastic. Popular for all ages; wearing multiples on one arm is very fashionable. 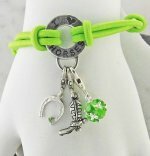 Stylish adjustable elastic bracelet on “I Heart Horses” carrier with 3 charms: Jumper charm, peridot rhinestone ball, and silver heart with peridot rhinestone accent. Lime green elastic. Popular for all ages; wearing multiples on one arm is very fashionable.